Two '59 Edsels Photo Picture Classic Cars for sale & Classifieds - Buy Sell Classic Car & Classic Truck Classifieds. looks like Apache Junction, AZ, so cars would be pretty intact. They do look very dry indeed and the hills in the background look like the desert Southwest. Cars here in Colorado are clean compared to the Midwest or Northeast but still have rust. I replaced the floors and put many patches in the outer body on my Plybomb. Oh baby! I wonder where they are. these 2 cars look to be in pretty decent shape and I wonder about the location of these cars because it looks to be maybe very dry where they are maybe way down south would be my 1st guess, could be off though....very little surface rust it seems. Now if only on the other side of this yard was a '60 Edsel convertible, 1 of only 76 ever made, that would be just too much! 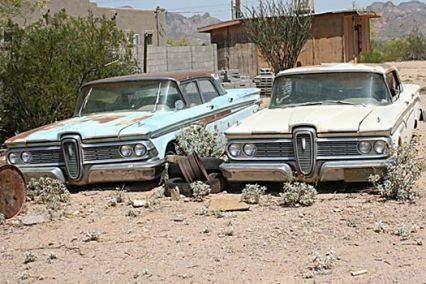 2 '59 Edsel four-door sedans. they don't look too bad either. very complete.